After a few logistical challenges with flights the Birmingham Lions squad arrived in Sweden to take on the Arlanda Jets. The rest of Europe generally play eleven a side Football, so the first hurdle for British teams playing club games in Europe (to this point, just the Lions) is to adapt and transition from their domestic format of seven a side competition. With the gameday roster expanded to accommodate some ballers from the Sandwell Steelers the team took to the field ready for a stern test, and that’s exactly what they got. The trip was made possible in no small measure, due to the Lions recent sponsorship deal with Ricor Global Ltd. General Manager Jo Kilby gave us some detail on the deal. “Our recent partnership with Ricor is going to be great for the team – not just because they’ve elected to provide us with invaluable funds, but genuinely because we have two principals in Dave and Anne Johanson, who are passionate about investing in and helping people...that they are American and huge Vikings fans, is a wonderful bonus, as it yields lots of natural synergies for us. We’ve spent a bit of time with both now, in person and via email, and it’s fair to say they’re great people and we’re really excited to be working with them”. I also caught up with Phoebe Schecter to get her take on the game and the bigger picture for women’s football in Britain. “The game against the Arlanda Jets was hard fought and came down to the last 5 minutes. It was a battle of the defences, offensively we were challenged with new looks and the importance of special teams was confirmed. The players, coaches, and staff worked really hard to get us here and it was a great opportunity to learn and develop ourselves as a team. The Lions keep bridging the gap internationally for Britball and setting the bar higher each time”. 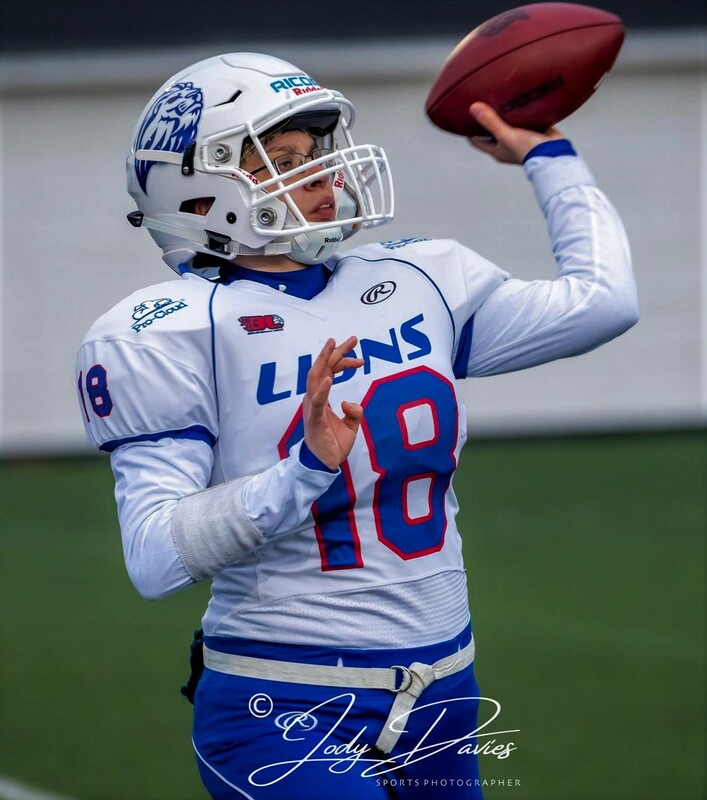 GB international Sydney Green was one of the Sandwell Steelers players who joined the Lions for this European adventure, she offered her thoughts on the experience. “The whole experience is something I’ll honestly never forget, even though I’ve played 11s internationally before this was a much different experience being part of the Pride. The game was tough from the beginning, with a great squad being physical on both sides of the ball. Natalie Parker getting her first start at QB was something I was looking forward to seeing, she did a great job leading the offence and driving them up field despite playing a fierce defence. Having the opportunity to play on defence doesn’t happen often for me now, but it’s always something I enjoy, so playing defensive end and linebacker was a big personal challenge. I’d love to get to do this more in the future! to consider we competed so closely with a team that only plays 11s even though our Sapphire series is 7s format - shows just how much potential this team has. With some good preparation ahead of next September the Transatlantic trophy 2 should be something incredible to be a part of”. 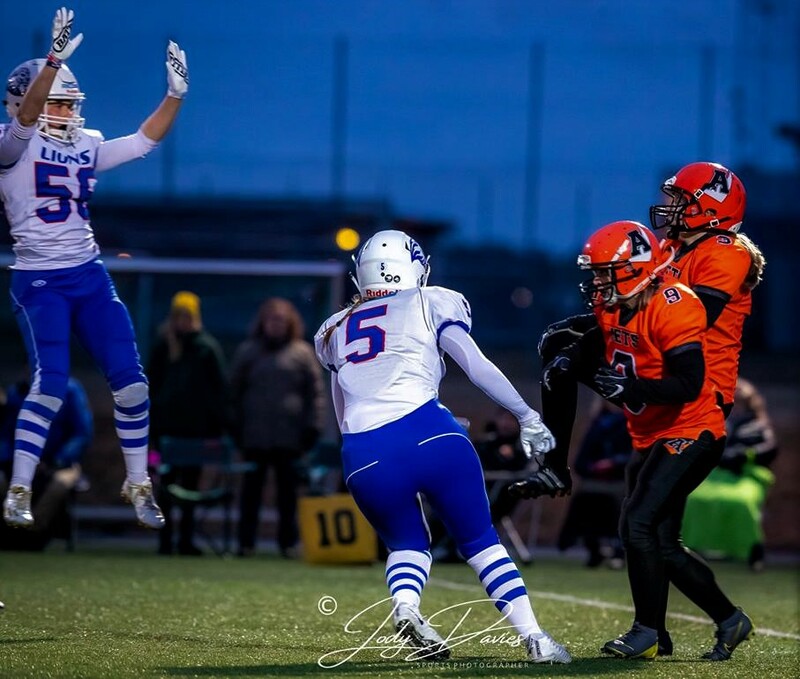 So, despite being on the wrong end of a 7-0 single score loss, it appears there are plenty of positives to be drawn by the Lions from this game, a sentiment echoed by Quarterback and General manager Jo Kilby. “The game against Arlanda was definitely a positive for us, despite the result, we were able to blood seven rookies (who had hitherto never played 11s before) whilst still remaining competitive. We can also be really happy about having taken four Sandwell players with us – and whilst only two were active (in Sophia Klair and Sydney Green), the contributions from Libby Davoren and Laura Williams, in helping us out behind the scenes, were both extremely helpful but also hopefully aided in giving the Steelers gang a complete view of our operations – something we were keen to offer in return. Quite a few injuries and absences coming into the game saw the team have to negotiate and navigate key changes so it was good to see the likes of Laura Moore taking exclusive reps on the OL, Green challenging at both LB and DE, Afia Law and Phoebe Schecter appearing on the offense and Ashleigh Aiston and Natalie Parker earning first starts at this level at RB and QB respectively”. 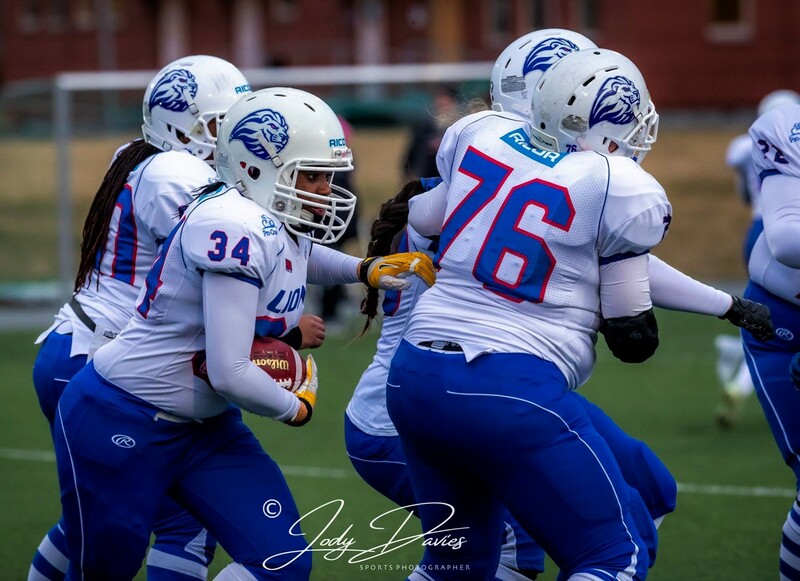 Whilst putting this article together and as a Britball fan in general, it’s clear to me that once again, the Lions have led the way for the other British teams in developing the women’s game here. If we want to compete and have success in Europe at both a National and Club level, we need to establish an eleven a side domestic competition immediately. If that means that some clubs end up merging, then let’s do it, this has been the case for countless men’s teams. It will benefit everyone in the long run.